The Orwellian/Romans 1 insanity of our culture seems to become more plain and laughably tragic with each passing minute. We raise debt ceilings to not raise the debt, we bail out stock holders and “too big to fail” businesses in the name of “preserving the free market system”, we destroy liberties at home in the name of “preserving our freedom”, we go to war in country after country in the name of peace, and we keep flying folks in from West Africa in order to fight the spread of Ebola. And, even more accurately: Welcome to Romans 1 America. On the economic front, the latest wave of free market crushing activity done in the name of preserving free markets is the recent action taken by the Federal Reserve to comfort and assist the “too big to fail” class by (once again) embarking upon a(nother) massive asset bubble preservation/re-inflation project. Before we get into the particulars of this week’s Corpo-Fascist style manipulation of the economy and culture in the name of America and freedom, let’s take a moment to note some of the consequences of these sorts of unbiblical economic actions. Last week, as the markets took a header and were down, down, down, the money-printing class intervened on behalf of the larger protected class and at the expense of all others…again. It’s what they’ve been doing for generations now, and it’s why the US dollar has purposefully lost over 90% of its real-world purchasing power under the steady, manipulative, thieving hand of the Federal Reserve. But let me explain about the unknown forces in the market these days. Call it by a nickname — the Plunge Protection Team. Or call it the President’s Working Group on Financial Markets, the official name given to the group when it was formed by President Ronald Reagan after the market turbulence of 1989. These forces may be working from a script in the “Doomsday Book,” which the US government recently fought to keep secret when it was brought up last week during the AIG trial in Washington. Here’s the bottom line: Someone tried to rescue the market last Wednesday. And it’s becoming a regular occurrence. How “free market” is that? And who gets the bill for these “rescues” (aka bailouts)? Who pays the price? Look it up. Oct. 27, 1989, Wall Street Journal. Headline: “Have Fed Support Stock Market, Too.” By Robert Heller, who had just left the Fed to head up the credit card company Visa. In case you don’t know the lingo, Heller is proposing that the Fed or government purchase stock futures contracts that track — and can influence — the major indices. These contracts are cheap and a government could turn the whole stock market around quickly — but probably not permanently. So once again we have the illusion of stock and certain asset wealth preserved through the further dilution of the dollar…for now. Of course, this can’t go on forever. It must end, and end very badly, as all biblically abominable pursuits must (see: Proverbs 11:1). But, in the meantime, more pain and the (purposefully) increased threat of State dependancy is brought to those struggling under the bottom of this unholy Ponzi Pyramid. Lord willing, the Church will lead the way in repentance and restoration in the economic realm and all others through the faithful proclamation and application of the Gospel and Great Commission. Until then…War is peace, ignorance is strength, and freedom is slavery in Romans 1 America. There is no escape from any of this apart from the nature of Christ the King as revealed in His perfect Word. Fear not, stock holders! 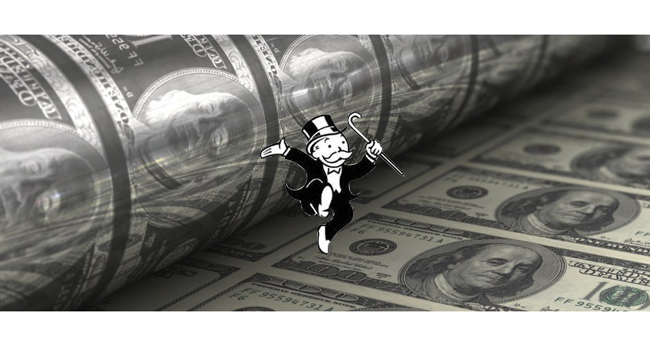 The Monopoly money printing presses are here to save you (and bury the rest of us)…again.